Our promotional printed Microfibre cloths can be supplied bulk packed or in a variety of packaging options to enhance presentation. Call now for options! If you do not require your cloths individually packed we can supply them bulk packed. Packed in bundles in a polybag. This is a lovely way to give each lens cloth a good presentation. We have a number of different sized polybags. 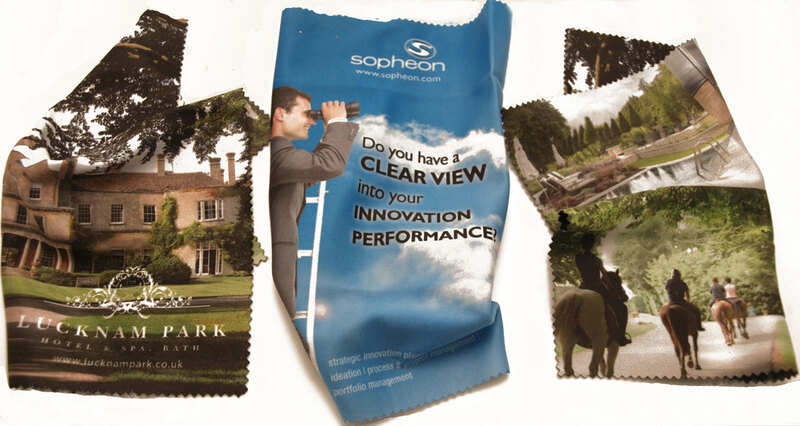 You can tell us if you would like your cloths to be flat packed or folded to make optimal use of artwork. This packaging is more durable than the polybag. Our standard case is about the size of a business card at 9.5 x 5.8 cm. The other sizes we have available are 9.8 x 7.0 cm, 10.5 x 7.5 cm and 11.0 x 11.0 cm. You can tell us how you would like your cloths folded. We also now have this new vinyl case which has a white popper as standard as opposed to a flap as in the vinyl cases above. We have one size available - 10.0 x 6.3 cm. Paper cases printed up to full colour gloss laminated cardboard. Available in many different shapes and sizes - the most popular size is 12.5 x 6.5 cm.